Petr Cech, after making an assessment of his side’s draw with Tottenham in the North London derby last weekend, is of the opinion that Arsenal still has a chance in clinching the league title. Arsenal ended up in a draw at home in the derby against Tottenham, thus pushing them down to the fourth position on the Premier League table. The first third of the season is nearly coming to an end but the title race would likely be a hotly contested one as five teams sit at the top of the table within five points. Cech however, believes that Arsenal could come up to win the title race if only they could get over the disappointment of not winning the derby at home after a penalty by Harry Kane cancelled out an own goal by Kevin Wimmer’s in the first half of the game. 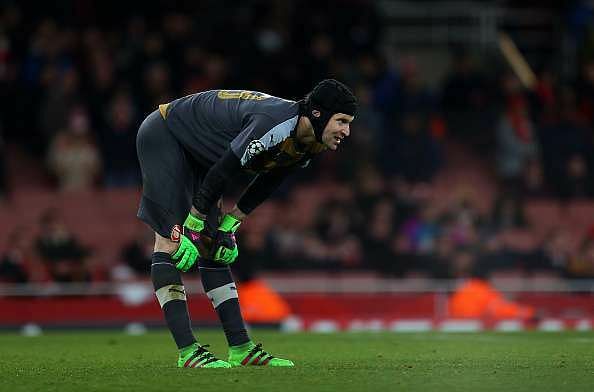 “If you keep your consistency then you have chance to do it,” Cech told reporters. “We are in a very good position with a lot of games to be played. The Sunday game saw Arsenal come into the game with much gusto, sustaining pressure on the visitors. They were rewarded in the first half after MesutOzil’s free kick was flicked by Wimmer into his own net. However, Spurs were not to be deterred as they came in full force during the second half of the game, with an equalizer from Harry Kane, scored from the penalty spot. Arsenal was lucky as an attempt by Tottenham to take the lead through a shot from Christian Eriksen was saved by Petr Cech. Cech also expressed his disappointment at the outcome of the game despite their early lead which he attributed to the equalizer that came early in the second half, thu destabilizing them.